Let me begin with the Japanese Imperial Court, or more precisely with the crown prince. His personal sword for self defence – which is called a mamorigatana (守り刀) – is the Tsubokiri no tsurugi (壷切剣). The history of this sword can be traced back to the time of emperor Daigo (醍醐天皇, 885-930, r. 897-930). First of all, the origins of the swords are somewhat unknown and in old documents it is referred to by different names like, for example, Kiritsubo no tsurugi (斬壷剣), Kiritsubo no tsurugi (切壷剣), Tsubokiri no tsurugi (壷斬剣) or with the aforementioned characters (壷切剣). From the meaning of the characters it can be assumed that at one time a kind of jar (tsubo, 壷) was cut through (kiri, 斬り・切り) with the sword. Incidentally, there is the theory that the first and initial nickname of the sword was Kiritsubo no tsurugi (斬壷剣). An old legend says that the sword was once owned by Chōryō (張良, chin. Zhang Líang, 262-189 BC), a famous tactician of the Chinese Hàn dynasty (漢, 206 BC to 220 AD). But this is a mix-up with Fujiwara no Nagara (藤原長良, also read as Fujiwara no Nagayoshi, 802-856) based on the similarity of characters (張良 → 長良). The most accepted history of the sword states that the Tsubokiri no tsurugi went from the possession Nagara into that of his younger brother Fujiwara no Yoshifusa (藤原良房, 804-872) who bequeathed it to his adopted son Fujiwara no Mototsune (藤原基経, 836-891). By the way, Mototsune was the natural third son of Nagara. But we do not know from which Fujiwara it went eventually into the possession of the emperor or the crown prince. Because of the complexity of the subject and for a better understanding we have to examine briefly the connection of the Fujiwara family with the then Imperial Court. From left to right: Fujiwara no Nagara, Fujiwara no Yoshifusa, Fujiwara no Mototsune. The portraits were made by Kikuchi Yōsai (菊池容斎, 1781-1878). From 1825 to 1836, he compiled in the Zenken Kojitsu (前賢故実) publication a collection of more than 500 monochrome portraits of historical figures. When the Imperial capital was transferred from Nara to Heiankyō (平安京, present-day Kyōto) in 794, the then emperor Kanmu (桓武天皇, 737-806, r. 781-806) introduced new government offices which gave more direct power to the emperor and his closest aides. This resulted in a stable government for almost half a century, at the same time the Fujiwara family was also able to gain supremacy over all the aristocratic families. At the end of this development the emperor was once again reversed to a mere representative role, as it was the case in the Yamato era. In 857 emperor Montoku (文徳天皇, 827-858, r. 850-858) appointed the aforementioned Fujiwara no Yoshifusa, previously his aide, as chancellor (daijōdaijin, 太政大臣). The latter eventually managed to set his own minor grandson on the throne as emperor Seiwa (清和天皇, 850-881, r. 858-876). Yoshifusa himself took the title of regent (sesshō, 摂政), a post which literally translates as “governing additionally.” This set a precedent; it was namely the first time that a person other than a prince had taken the post of regent of an underage emperor. But what was more controversial for the then imperial family and the other aristocrats was the fact that Yoshifusa continued his regency even after Seiwa became of age. Yoshifusa´s successor, Fujiwara no Mototsune, changed the name of his inherited post of sesshō to that of kanpaku (関白). This later became the common title for a regent of an emperor of age to rule. Mototsune acted as kanpaku regent for emperor Kōkō (光孝天皇, 830-887, r. 884-887). From then on the Fujiwara family held the monopoly of the combined post of sesshō-kanpaku, i.e. to govern an underage emperor and an emperor of age. This led to two hundred years of Fujiwara dominance at the Imperial Court, earning the nickname Fujiwara Era. But let us return to the Kiritsubo no tsurugi. Today it is assumed that the sword passed from Mototsune to emperor Uda (宇多天皇, 867-931, r. 887-897). Uda was the son of Kōkō. Kōkō made use of a “trick” known since the 8th century AD aimed at reducing the political influence of his sons and to end the disputes in the succession to the throne by granting them family names. These given clan names like Minamoto (源), Tachibana (橘) and Taira (平) – in the case of Uda it was Minamoto – still marked the sons as members of the aristocracy but they lost their claim to the throne. However, their direct descent from the imperial line committed them to loyalty. Later, when it was time to pick a successor to Kōkō´s throne, the choice fell anyway on Uda again. Well, there is also another approach regarding the Kiritsubo no tsurugi, namely that it had passed from Fujiwara no Yoshifusa to emperor Montoku. This assumption is based on the following legend: when the sickly Montoku was again close to death, the imperial family sent for a Yin-Yang master (onmyō-ji, 陰陽師). Spiritual advisers were common practice back then for healing diseases. They gave the Kiritsubo no tsurugi to the master, whose name is not known, in order to use the swords inherent power to pray for the emperor’s recovery. But it did not help, Montoku died at the young age of 32, and the Yin-Yang master fled taking the sword with him. Later it was rediscovered – according to tradition entirely intact and unharmed – during excavations around Kyōto´s Shinsen´en garden (神泉苑). *1 It is said that this took place before the fifth year of Ninna (仁和, 889). So the first handing over of the Kiritsubo no tsurugi as mamori-gatana for the crown prince probably took place in the fifth year of Kanpyō (寛平, 893) when emperor Uda´s son Daigo – mentioned at the beginning of this chapter – was officially nominated as crown prince. Daigo´s mother Taneko (胤子) was a Fujiwara and there is the tradition that the Fujiwara imposed a condition on the Kiritsubo no tsurugi, namely that it should only be handed over to a crown prince whose mother was a Fujiwara on her father’s side. The first difficulties emerged with the later emperor Go-Sanjō (後三条天皇, 1034-1073, r. 1068-1072) whose mother was “only” a maternal Fujiwara. So the Fujiwara boycotted the handing over of the sword and also the succession to the throne of Go-Sanjō. But because the previous emperor Go-Reizei (後冷泉天皇, 1025-1068, r. 1045-1068) had no sons, his brother Go-Sanjō was the next legitimate candidate. The distrust of the Fujiwara turns out not to be unjustified because Go-Sanjō paved the way for a dissolution of the kanpaku regency. He abdicated in 1072 due to illness and retired to a monastery (in, 院), but because of his death in 1073 he didn’t have the time to exercise power in the name of his son Shirakawa (白河天皇, 1053-1129, r. 1073-1086). But the latter continued the aim of his father and abdicated ahead of time to govern the destinies of his own son from the monastery, and to prevent the power falling into the hands of the Fujiwara. *2 Well, it would have been better if the Fujiwara had handed over the sword to the crown prince before because it was destroyed in a fire at the imperial palace which raged on the eighth day of the first month of Kōhei two (康平, 1059). But a replacement was made by an unknown smith. Because Shirakawa´s mother was a Fujiwara on her father’s side, the newly made sword was eventually handed over to him. Bad luck, part of the palace caught fire again on the eleventh day of the twelfth month of the same year. The sword was not destroyed but damaged, the blade had to be re-tempered (yakinaoshi, 焼き直し) and a new mount had to be made. Some reports say that the new saya showed lacquer ornamentation in the form of bays and a mother-of-pearl inlay of dragons and that the suspension (obitori, 帯執り) was of blue leather. In 1221 when emperor Gotoba (後鳥羽天皇, 1180-1239, r. 1183-1198) provoked the Jōkyū War (Jōkyū no ran, 承久の乱), the copy of the Tsubokiri no tsurugi was lost in the turmoil’s. When the new born prince Hisahito (久仁) – the later emperor Go-Fukakusa (後深草天皇, 1243-1304, r. 1246-1259) – was to be nominated as successor to the throne in the first year of Kangen (寛元, 1243), it was decided that another replacement should be made. But later, during emperor Kameyama’s (亀山天皇, 1249-1305, r. 1259-1274) ceremony of the succession to the throne in Shōka two (正嘉, 1258), the first replacement which was lost in the Jōkyū War was found in the treasury of the Shōkōmyō´in (勝光明寺). With this, the swords were exchanged, that means the Tsubokiri no tsurugi extant today is the first replacement made after the fire in 1059. Several hundred years later, at the beginning of the Edo period, the sword was almost destroyed by fire again. But the sources disagree. One says that it was the great fire in the second year of Jōō (承応, 1653) and the others that it was the fire in Manji four (万治, 1661). Anyway, it is said that it was rescued from the smoking ruins and after a new polish it turned out that the blade’s tempering was still intact. Of course, a new mounting had to be made. The Tsubokiri no tsurugi reappears in the chronicles regarding emperor Higashiyama (東山天皇, 1675-1809, r. 1687-1709). His father, emperor Reigen (霊元天皇, 1654-1732, r. 1663-1687), abdicated in the sense of the old system and acted as regent to his thirteen year old son, though only after appointing Higashiyama as successor to the throne on the 25th day of the third month of Tenna two (天和, 1682). Two days later he sent, in a cloak-and-dagger operation, the courtier Tsuchi-mikado Yasutomi (土御門泰福, 1655-1717) to bring the Tsubokiri no tsurugi for the soon to be held official ceremony. Normally, the Court protocol was that the sword was given to the prince after his nomination as crown prince by an officer of the Imperial guards, i.e. after the so-called rittai-shiki (立太子式) ceremony. But it is assumed that such a ceremonial handing over of the Tsubokiri no tsurugi had not been performed for a long time and so there were some „uncertainties“ in the ritual. Incidentally, the Japanese court protocol confirms that such a rittai-shiki ceremony was held on November 3rd 1916 when Hirohito (裕仁) – the later emperor Shōwa (昭和天皇, 1901-1989, r. 1926-1989) – was appointed crown prince. 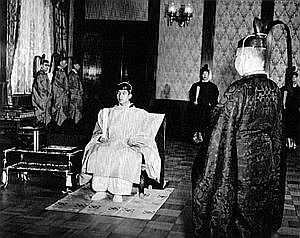 The ceremonial rittai-shiki of prince Akihito (明仁) on October 19th 1953. Unfortunately there exists no pictures of the handing over of the Tsubokoro no tsurugi but we can easily imagine the act by looking at the ceremony of the handing over of the Imperial regalia, the so-called Kenji-tō-shōkei no gi (剣璽等承継の儀, see picture below). On January 7th 1989, the three Imperial regalia were handed over to present-day emperor Akihito. The regalia consists of the sword Ame no Murakumo no tsurugi (天叢雲剣), the jewel Yasakani no magatama (八尺瓊勾玉), and the mirror Yata no kagami (八咫鏡). The ceremony was held in the Matsunoma hall (松の間) of the Imperial Palace in Tōkyō. The court official on the far right carries the sword in its chest. The latter is covered in red brocade, as is the box holding the mirror. 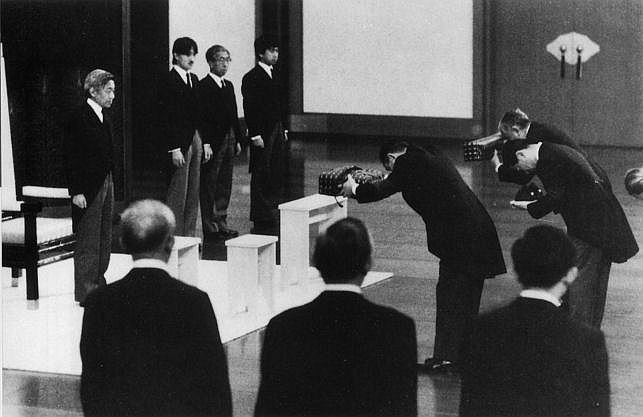 The handing over of the Imperial regalia to emperor Akihito. Details regarding the Tsubokiri no tsurugi sword itself are hardly known but that also applies to most of the time-honoured swords in the possession of the Imperial family. In Yamaguchi Yukimitsu´s (山口幸充) publication Karaki Zuihitsu (嘉良喜随筆) we read that it is a work of the legendary smith Amakuni (天国), but as his existence is doubted this approach is no longer followed today. In this work we also read about the anecdote that says that a princess, who married a member of the Konoe family (近衛), fell ill and the Tsubokoro no tsurugi was borrowed by the Konoe to support their prayers for her recovery. Apparently they “forgot” to return the sword, but subsequently when several cases of disease within the Imperial family occurred people began to remember that they were no longer under the protection of the crown prince’s sword and so it was returned. A theory says that the Tsubokiri no tsurugi has a nagasa of 62.1 cm and another speaks of 68.2 cm. One says the blade is straight and in kiriba-zukuri where only the tip section is forged in kissaki-moroha (see picture below), as it is in the case of the Kogarasu-maru (小烏丸). Others claim that the blade has a standard shinogi-zukuri shape. The tang is said to be curved and has two large irregular mekugi-ana. And some even go so far as to say that it is a work of the Ko-Bizen smith Nobufusa (延房). But Nobufusa is traditionally dated to the Genryaku era (元暦, 1184-1185) which does not correspond to the copy made in the 11th century. Another possibility could be that it is a work of Ko-Bizen Nobufusa (信房) written with a different character for Nobu. Some old sources date this Nobufusa back at least to the Kanna (寛和, 985-987) and Ei´en (永延, 987-989) eras. However, the Tsubokiri no tsurugi is today in the possession of crown prince Naruhito (徳仁, b. 1960). His appointment as crown prince took place on February 23rd 1991. A blade from the Shōsō´in in kiriba-zukuri with a double-edge tip section. *1 The garden, located south-east of Nijō Castle, was rearranged during the Meiji era. *2 This “cloistered rule” was called insei (院政).